Apr 14th. This is the second visit of Granny’s Attic. This is the second visit of Granny’s Attic. 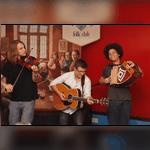 This young trio from Worcester comprising vocals, fiddle, guitar and squeezeboxes have bags of enthusiasm and I defy you to remain still while they sing and play. We are pleased to get them as they are very busy both at club and festival level. We had a full house the last time so come early.